Does anyone know who is in the picture? The date is unknown and it could be the Invergordon Recreation Ground. I think it is Harry's mother Ryal and Barry Russel. I think anon may be correct, although it is not clear. 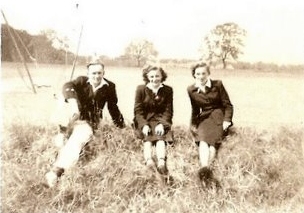 My sister Margaret (who is so much smarter than me) confirms that anon is correct, it is my mother and Barry Russell.